Bethesda’s Fallout 76 marketing is in full swing ahead of the game’s November 14th release. It’s releasing some very cool limited edition postage stamps across the UK and Europe that glow in the dark. 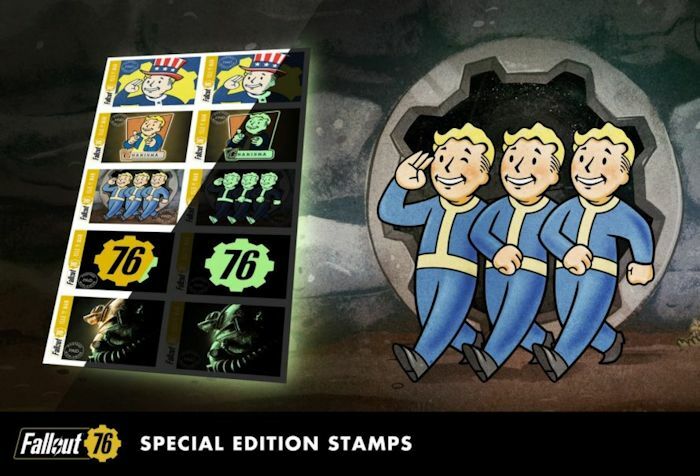 The set of five stamps feature imagery from the game, like Vault-Tec mascot Vault Boy, Power Armor, and some Perk Cards. They will be given out via social media and community promotional campaigns and competitions. Bethesda is really going all out for this game. They have previously teamed up with Hypemaker, Hypebeast’s creative agency, to auction off custom Power Armor helmets and stuck the cover of John Denver’s “Take Me Home, Country Roads” from the Fallout 76 trailer on iTunes, with profits for both of these going to Habitat for Humanity. That’s a great cause. They are really marketing the hell out of this game. The ninth entry in the Fallout franchise, Fallout 76 is an online, multiplayer survival game set in post-apocalyptic West Virginia. It is a prequel to the series, and the events hereprecede the events of the first game by 59 years. This game also has a map four times larger than Fallout 4. It is going to be a fun game and fans are sure to love it.